Click here to email The Pop Rocks! 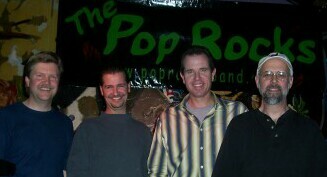 The Pop Rocks: A band formed by seasoned musicians from the Southeast Nebraska music scene. We’ve played in bands such as DV8, The Rockin’ Fossils, One More Time, and many others. We’ve created a band where importance is placed on Variety and Flexibility. Need to hear some lighter tunes early in the night, and dance music later? No problem. Some rock n’ roll? Sure. Country? Great! Weddings, anniversary parties, Valentine’s Day dances, you name it. See, we’re here to make sure everyone has fun, and to play music that you like--at a volume that’s appropriate. We know what it’s like to hear a band that’s too loud. We guarantee that volume will not be a problem. And yes, we take requests! Ready to hear some good music and have a GREAT time? Book ‘The Pop Rocks’ for your event!